This story originally appeared in the Spring 2019 issue of Domino, titled “Rainbow Rx.” Subscribe to be the first to receive each issue! We’re used to thinking about color in the context of design—a new shade of paint, the pattern combo everyone’s obsessed with—but in terms of our own emotional well-being? Not so much. Although maybe we should be. There’s a growing school of thought—one that’s recently moved from out-there alternative to downright mainstream—that believes color is the key to happiness, balance…and just about everything in between. From feeling confident and calm to getting a more productive night’s sleep, here are four easy color remedies to live by—go ahead and self-medicate. Changing your mood could be as simple (and fun) as throwing on a pair of brightly tinted shades. 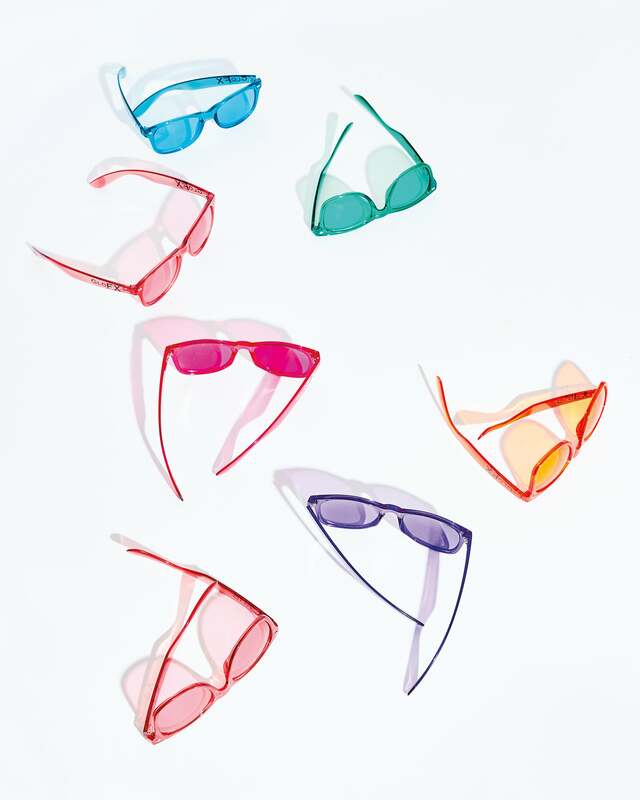 Chromotherapy glasses are said to subtly shift your outlook: Don red shades to boost confidence, blue to improve communication skills, and pink to ease stress. Wear for 10 to 30 minutes a day, and let the benefits, real or placebo, wash over you. Something as simple as wall color can dramatically change the vibe of your surroundings—and it can affect your mood, too. These color-expert recommendations will help you feel your best in each area of your home. Neutral-toned bedrooms can be almost as effective as a dose of melatonin when you need to drift off to sleep, according to Benjamin Moore’s creative director, Ellen O’Neill. Light, greenish blues make a perfect match, as do creamy off-whites and soft pinks. Always wanted to see your energy? Your aura—the invisible, electromagnetic field surrounding you—can be photographed, which may seem like just a camera trick, but Radiant Human’s Christina Lonsdale suggests there’s more than meets the eye. She uses a special dual-exposure-process camera to snap wavelengths, which showcase energy in vibrant hues. But decoding the meaning behind your photo is really where the fun begins. According to aura color theory, red indicates passion; orange means confidence; yellow is optimism; blue relates to trust and nurturing; and green reflects focus and determination. Color placement in the photo is very revealing, too. The shades at the top represent your consciousness; the left side mirrors how you see the world; while the right side is how the world sees you. While anytime is a good time for an aura portrait, according to Lonsdale, it’s especially telling after a big life event. “I have been keeping a visual diary of sorts…it’s amazing to see all of these images together, kind of like being photographed in front of a landmark, but in this case, it’s the landmarks of your life,” she says. Choosing the right lightbulb comes down to more than just wattage. Domino editors love the simple act of swapping traditional bulbs with colored variations to cast a room in a new light. Editor in chief Jessica Romm Perez recommends using pink bulbs and candlelight to transform a tired white bathroom into a romantic, rose-tinted oasis. If you’re going for more of a rad ’80s vibe for your next party, she suggests trying a black lightbulb in the bathroom, then filling the tub with ice, booze, and glow sticks. Don’t want to swap out a bulb for every mood? There’s no need, thanks to the new Philips Hue smart bulbs, which let you choose from more than 16 million shades of colors, via its app, to light your room. Now that’s a lightbulb moment. Can Your Bodywash Affect Your Mood?